The Best Meat blogs from thousands of top Meat blogs in our index using search and social metrics. Data will be refreshed once a week. Also check out Top Meat Youtube Channels list for Top videos on Meat. 2.39 Moms Meatloaf Recipe | best meatloaf recipes to make with love! 2.48 Meat's Case | Current topics in the meat and poultry industry. Meat newsletter is a comprehensive summary of the day's most important blog posts and news articles from the best Meat websites on the web, and delivered to your email inbox each morning. To subscribe, simply provide us with your email address. About Blog Daily news on meat processing and poultry, processors and industry. Free access to news on poultry and meat packaging, equipment and production. Global Meat News is a world's leading website for news, information and analysis on the international trading, processing and production of red and white meat. Facebook fans 1,601. Twitter followers 4,786. Minneapolis, MN About Blog BEEF, the nation’s leading cattle publication, publishes monthly issues for the nation’s top cow-calf operators, stocker-growers, cattle feeders, veterinarians, nutritionists and allied industries, covering production, animal health, nutrition, finance and marketing issues. Facebook fans 39,681. Twitter followers 28,825. Tulsa, OK About Blog Learn to smoke meat with jeff phillips. Blog post covers smoking meat techniques, tutorials, recipes and guide to meat smoking the right way. Facebook fans 199,408. Twitter followers 4,583. Kansas City, Mo. About Blog One-stop complete news resource for news, ideas, trends, innovations, issues and more that impact the meat and poultry processing industry. Facebook fans 296. Twitter followers 3,963. Des Moines About Blog Find pork recipes, cooking tips, ideas, tutorials and more through PorkBeinspired.com. Provided by the National Pork Board. Facebook fans 639,805. Twitter followers 13,255. Minneapolis, MN About Blog BEEF, America's leading cattle publication, publishes 12 monthly issues for cow/calf operators, stocker-growers, cattle feeders, veterinarians, nutritionists and allied industries. Facebook fans 40,848. Twitter followers 29,404. Toowoomba, Queensland About Blog BeefCentral.com is a free online news and market intelligence service dedicated to the Australian beef industry. BeefCentral.com is updated with content written specifically for the Australian beef industry, including local, national and international industry news, market and price trends sections dedicated to production, processing, lotfeeding, live export and international beef trade. Facebook fans 13,915. Twitter followers n/a. San Francisco, CA About Blog All things good and meaty. The tasty flesh of every animal shall be discussed here. Facebook fans 1,089,038. Twitter followers 472,437. Facebook fans 22,315,505. Twitter followers 212,884. UK About Blog Meat Management magazine is the modern, independent voice of the UK meat industry, offering news, opinion, expertise and information to Britain’s top managers and executives. Facebook fans n/a. Twitter followers 1,328. Australia About Blog Meat & Livestock Australia Limited (MLA) is the marketing, research and development body for Australia's red meat and livestock industry. MLA works in partnership with industry and government to achieve profitable and sustainable cattle, sheep and goat industry. Facebook fans 23,328. Twitter followers 16,572. Canton, MO About Blog US Wellness Meats was founded in 2000 in Monticello, by visionary farmers, who saw that big-business cattle-raising practices were taking a toll on our animals and our health. By returning to rotational grazing practices that are good for the planet and good for our cattle, we led the way in introducing a new generation to the unmatched taste, tenderness, and healthiness of grass-fed beef. Facebook fans 49,122. Twitter followers 11,726. Durham, NC About Blog A blog devoted to barbecue & grilling recipes, reviews, tips, and tricks. Facebook fans 3,054. Twitter followers 2,240. Denver, CO & Washington, D.C. About Blog The National Cattlemen’s Beef Association (NCBA) is the trusted and definitive voice serving the beef industry. Its mission is to provide the safest, highest-quality, most consumer-friendly beef and beef products in an environmentally and economically sustainable manner Vision. Facebook fans 91,585. Twitter followers 18,230. UK About Blog Simply Beef and Lamb is the home of Red Tractor and Quality Standard beef and lamb. Get inspired with hundreds of delicious recipes to choose from. Facebook fans 44,506. Twitter followers 4,628. About Blog At Clover Meadows Beef, we raise all-natural Missouri Grass Fed Beef, and Grass-Fed-Grain-Finished Beef. Clover Meadows Beef is a 5th generation family farm, and we sell grass-fed-grass-finished beef and grass-fed-grain-finished beef. Facebook fans 781. Twitter followers n/a. Seattle, WA About Blog Marx Foods Blog helping you cook the good stuff since 2007 (since 1895 offline). This page will feed you tasty recipes, chef tips, random food facts & more! Facebook fans 12,903. Twitter followers 1,685. Texas About Blog Beef Loving Texans is your one-stop information center for beef recipes, cooking techniques and real life stories. Lean more about beef today. Brought to you by the Texas Beef Council. Facebook fans 155,978. Twitter followers 38. Boston, MA About Blog isit the Verde Farms blog for the latest news, tips, and mouth-watering grass-fed beef recipes. Facebook fans 61,176. Twitter followers 766. About Blog stay up to date on the latest Canadian beef research news. The BCRC is committed to funding leading-edge research to position the Canadian beef cattle industry as a global leader in beef quality, animal health, food safety and environmental stewardship. Facebook fans 1,887. Twitter followers 4,835. Dublin, Ireland About Blog Multi-award winning food blog by Conor Bofin, Whether its beef, lamb, pork, venison or even goat, Ireland offers some of the very best meat in the world. With a little bit of effort and attention, anybody can cook fantastic meals using Irish meat. I try to prepare as wide a variety of dishes with numerous global influences. Facebook fans 2,065. Twitter followers 744. North Sydney, Sydney About Blog The Australian Meat Processor Corporation (AMPC) is the Rural Research and Development Corporation that supports the red meat processing industry throughout Australia. Facebook fans 168. Twitter followers 273. About Blog A Journey in search of Meat Products by Chilebrown Madmeatgenius. I would like to share some fun and unusual ways of preparing meat with a few vegetables with recipes and cooking. There will be a lot of posts on barbequing. About Blog Meaty Content for Hungry Souls. Find grass fed beef recipes, information & more by visiting the Western Grassfed Beef Blog. Facebook fans 5,166. Twitter followers 43. About Blog A blog for stakeholders in beef cattle and genomics by Jared Decker, He is the MU Extension State Beef Genetics Specialist and uses computational genomics to research cattle genetics. He is passionate about beef cattle genetics and helping beef farmers and ranchers adopt new technologies and best practices. Facebook fans 465. Twitter followers 1,983. Hexham, United Kingdom About Blog The National Beef Association is the main voice for all UK cattle producers and finishers and aims to serve as the beef industry leader. Facebook fans 1,951. Twitter followers 4,625. About Blog A blog about Raising animals for food in western washington by Bruce King. About Blog Key purpose of the Red Meat Industry Forum is to represent the Red Meat Industry. Focus areas of the Red Meat Industry are Meat safety monitoring, Independent meat hygiene inspection, Meat classification coordination and Meat labelling. Facebook fans 1,125. Twitter followers 746. About Blog The international magazine for the meat handling industry and processing industry. Meat Packing Journal covers the meat industry from slaughterhouse to supermarket in a manner that makes you say 'wow'. Facebook fans 63. Twitter followers 943. About Blog Welcome a new fed cattle and beef-focused website. Our intention is that “The Beef” be a place for frank talk about extreme market conditions and changing times in our industry, the reasons for them, and the possible strategies to adapt to survive. Facebook fans n/a. Twitter followers 887. About Blog This blog will now act as a reference for the meals that we eat out and will cover the cheap through to the higher end. I will keep it honest at all times. I sincerely hope that you enjoy reading it as much as I enjoy eating it. Facebook fans n/a. Twitter followers 6,305. Canada About Blog Canadian Meat Business, the leading magazine for producers, processors and distributors of beef, pork and poultry, was launched in 2002 and is published six times per year, distributed directly to more than 7,600 food and meat industry professionals across Canada. Facebook fans 172. Twitter followers 1,249. Arizona About Blog The Arizona Beef Blog is a place to learn about a new cut of beef which may have looked intimidating at the meat case, but after reading our blog post will leave you feeling confident and ready to tackle something new. Facebook fans 5,912. Twitter followers 2,325. London About Blog Latest news and features on meat industry from theguardian.com, the world's leading liberal voice. Facebook fans 7,322,975. Twitter followers 6,425,040. Crawley, UK About Blog Food Manufacture is a market-leading magazine for Britain's food and drink manufacturing industry. Follow us to keep up with articles on meat and poultry. Facebook fans 2,523. Twitter followers 27,391. About Blog Celebrating the awesomeness of food. A recipe blog featuring fun and easy modern comfort food, delicious photography and the occasional vegetable. The meat recipes on I am a Food Blog range from fun and unfussy to a little more involved, but ultimately, they’re all delicious. Facebook fans 28,291. Twitter followers n/a. Facebook fans 7,629. Twitter followers 22,294. 39. Moms Meatloaf Recipe | best meatloaf recipes to make with love! About Blog A lifestyle blog with easy meat recipes for your kitchen, and others to help you save money, lose weight, and live your most inspired life. Facebook fans 973. Twitter followers 5. Harvey, Western Australia About Blog Since 1919 Harvey Beef has been delivering the finest beef from pristine Western Australian pastures to our customers in Australia and around the world. Facebook fans 3,976. Twitter followers 333. US About Blog Jef is a avid Meat Smoker and loves to cook for family and friends. So he decided to start this video series of how to make many of the various dishes that grace the grates of his smoker. Subscribe to this channel for more of such amazing meat recipes. The Netherlands About Blog Marel is a leading global provider of advanced equipment, systems and services to the meat industry. Stoneleigh Park, Warwickshire About Blog AHDB Beef & Lamb is the organisation for beef and lamb levy payers in England. We exist to enhance the profitability and sustainability of the English beef and lamb sector. Our aims are to help the beef & sheep meat supply chain become more efficient andto add value to the beef and sheep meat industry. Facebook fans n/a. Twitter followers 10,922. Tasmania About Blog Red Meat Updates is an industry event developed to support Tasmania's red meat sector by providing topical and relevant information to producers & industry. Facebook fans 332. Twitter followers 685. Purdue University About Blog This blog was created by the Purdue Beef Team as an educational forum for beef producers and Extension educators. It includes timely news, issues, and management tips that have the potential to affect the beef business and decision-making process. Opinions expressed in the news clips do not necessarily represent those of Purdue University or the beef industry. About Blog My name is Christer and I live in Sweden with my wife, kids and dog. I love hunting , good food and barbecue. But there are so much more then just barbecuing the meat. Smoking bacon, Beef jerky, Making sausages....u name it.With this blog I like to share my experiments and results. Good and bad. I hope my photos makes u a little bit hungry though. Northwest Arkansas About Blog I am Janeal Yancey. I have a Ph.D. in meat science, but I am also just a Mom trying to raise two crazy little girls. I hope that can help other moms feel more knowlegable about the meat they feed their families. Feel free to ask any question. Facebook fans 3,594. Twitter followers 2,209. 48. Meat's Case | Current topics in the meat and poultry industry. Washington, D.C. About Blog The NorthAmerican Meat Institute, founded in 1906, is the oldest and largest association representing the U.S. meat and poultry packing and processing industry. Facebook fans 1,829. Twitter followers 9,330. About Blog Posts about Meatloaf, Beef & Pork written by Annie spaulding. Annie ia a meat, beer and rock n' roll loving gal in Chicago who loves to write about the best eats, travels, partyin' and entertaining. Facebook fans 226. Twitter followers 210. 40 miles from gas or groceries About Blog Welcome to Faith Family and Beef - I'm so glad you're here! In my little corner of the interwebs, you'll find my story, a place to connect, beefy recipes, tips and tricks, and hopefully, inspiration – as told by me. I'm, Terryn, by the way - a wife, mother, food safety enthusiast. Facebook fans 3,533. Twitter followers 542. Facebook fans 1,946. Twitter followers 7,404. 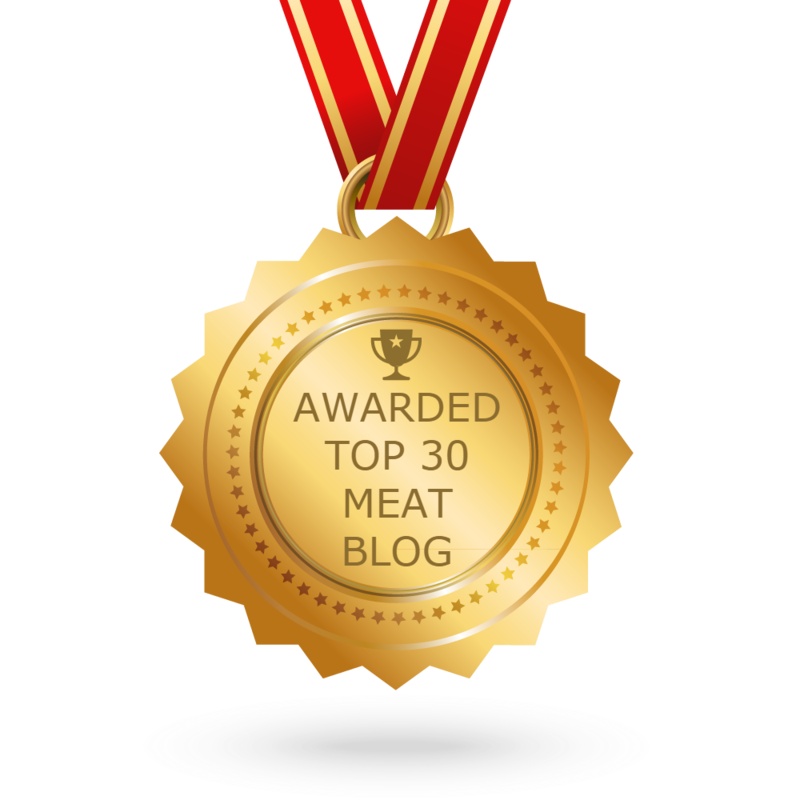 CONGRATULATIONS to every blogger that has made this Top Meat Blogs list! This is the most comprehensive list of best Meat blogs on the internet and I’m honoured to have you as part of this! I personally give you a high-five and want to thank you for your contribution to this world.